Jesus (c.6 B.C.-c.36 A.D.) was a spiritual leader who flourished, about two thousand years ago, in an area that is now part of modern-day Israel. Jesus was a Jew, born into a society that was administered by Jewish authorities under the rule of the early Roman empire. The principal historical writings relating to Jesus are the four Gospels that comprise the New Testament. Aside from this, there is very little other contemporaneous information about his life. 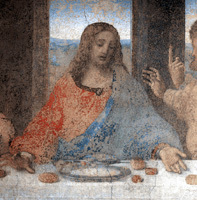 Most historians generally accept the accounts of Jesus as described in the Gospels, although the stories do contain significant inconsistencies. There is no firm evidence when Jesus began to preach and how long he did so. In his lifetime, however, his influence was limited to a small cult-like following. Throughout his years of preaching, Jesus attracted followers, of whom he trained twelve as disciples to spread his teachings and to perform faith healing. As you know, people who incite public unrest are generally looked upon as troublemakers by those in authority. This was certainly the case with Jesus, who was crucified by the Romans, upon the orders of Pontius Pilate, the Roman governor of the area. According to the Gospels, Pilate acted at the behest of the Jewish religious leaders. However, Pilate was a particularly harsh ruler who put many people to death for lesser offenses, and it is equally plausible that he simply considered Jesus a threat to his rule. Jesus is more of a mythical figure than a historical personality, and how one thinks about him depends very much on one's beliefs. Today, Jesus is more of a mythical figure than a historical personality, and how one thinks about him depends very much on one's beliefs. Christians, for example, consider Jesus to be the actual son of God, the authentic Messiah whose death and resurrection brought the possibility of salvation to all mankind. Muslims consider Jesus to be a prophet, although not the most important one. Jews, on the other hand, see Jesus as a false Messiah, not divine at all. Still, there is no doubt that Jesus, whoever he was, was one of the most important people in history. For example, although the exact years that Jesus lived are not known, we commonly use the designations B.C. and A.D. to stand for "before and after Christ". Similarly, although the dates of his birth and death are unknown, people around the world routinely celebrate his birth (on December 25) and his death (on Good Friday).